I am excited to work with Hungry Jack to bring you great ideas for hosting a breakFEAST. While this post is sponsored, all thoughts and opinions are my own. We are huge pancake fans in our house. From hosting pancake bar parties to enjoying pancakes pretty much any morning for breakfast, we love pancakes and, especially, pancake syrup. I’ve been super busy in the mornings recently so, on Sundays, I’ve been making cranberry orange pancake muffins. From the moment fresh cranberries appear in the store, I start thinking of ways to use them. 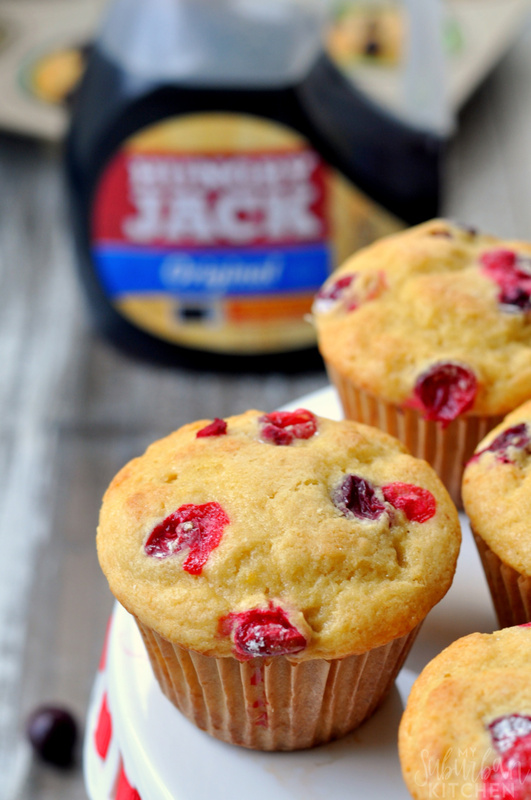 These pancake muffins are perfect for this busy time of year. I typically make them on Sunday and we can enjoy them throughout the week. 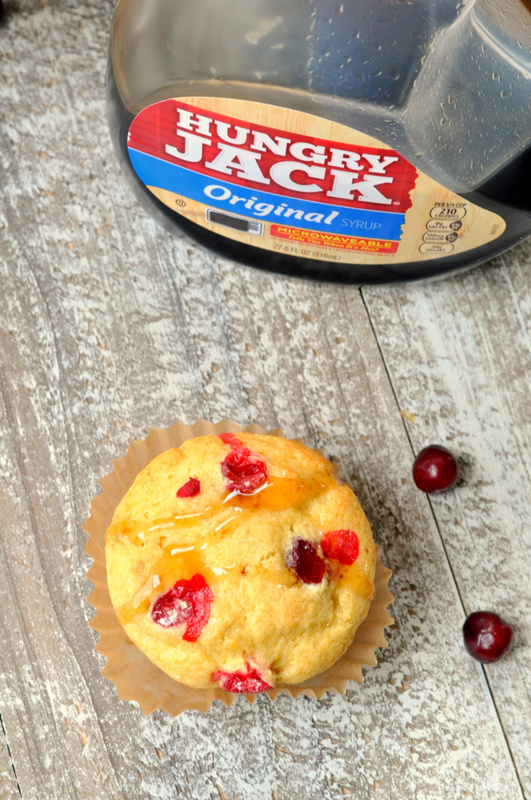 Just simply heat them up and top with delicious Hungry Jack pancake syrup. Hungry Jack’s syrup bottle is uniquely designed to fit in the microwave, allowing the entire family to savor the warmth and deliciousness in every bite. 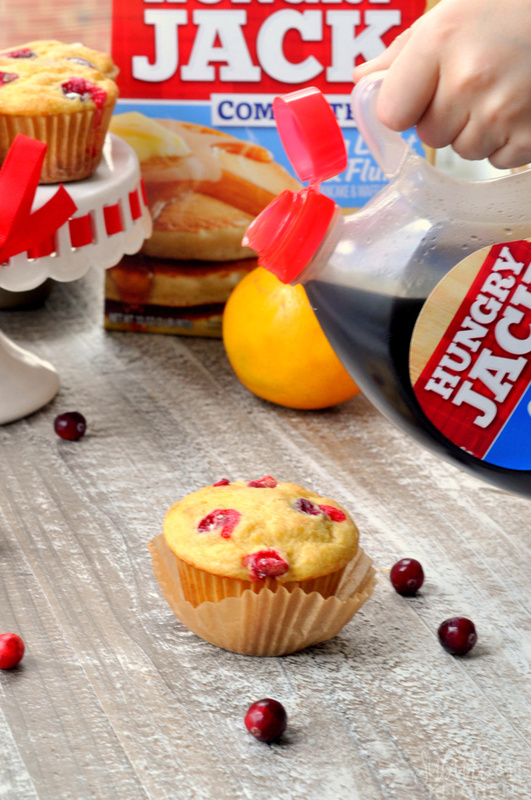 With an easy pour cap, Hungry Jack syrup ensures your pancake breakFEAST will be mess-free, perfect for the kids! 1. Preheat oven to 350 degrees. Line muffin tin with paper liners or spray with nonstick cooking spray. Set aside. 2. 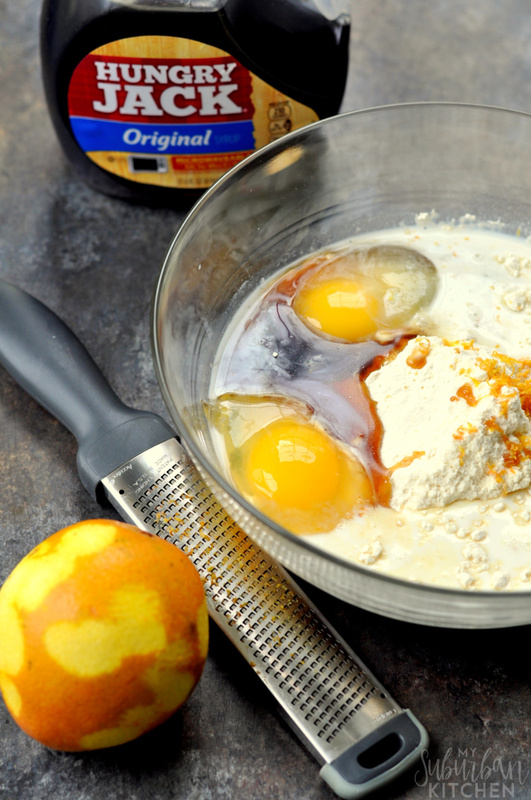 In a large mixing bowl, combine pancake mix, milk, eggs, orange zest and Hungry Jack pancake syrup. Mix well. 3. Divide batter between prepared muffin cups filling each to 2/3 full (you may have extra). 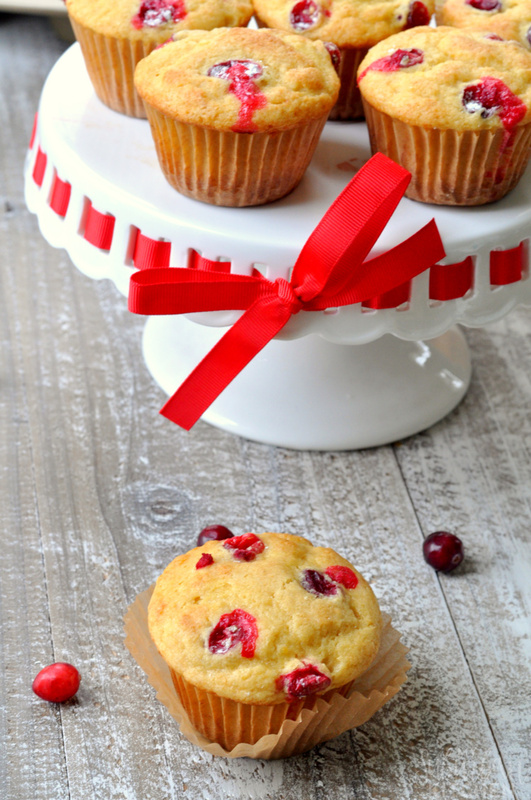 Divide cranberries between muffin cups. 4. Bake in preheated oven for 15 minutes. Remove from oven and enjoy topped with Hungry Jack pancake syrup. These muffins have the perfect flavor of pancakes and syrup blended together. Since I use Hungry Jack complete pancake mix, they are perfectly fluffy and taste so delicious. I love that the syrup is baked in. Of course, I still add more syrup to the top when I eat my cranberry orange pancake muffin. 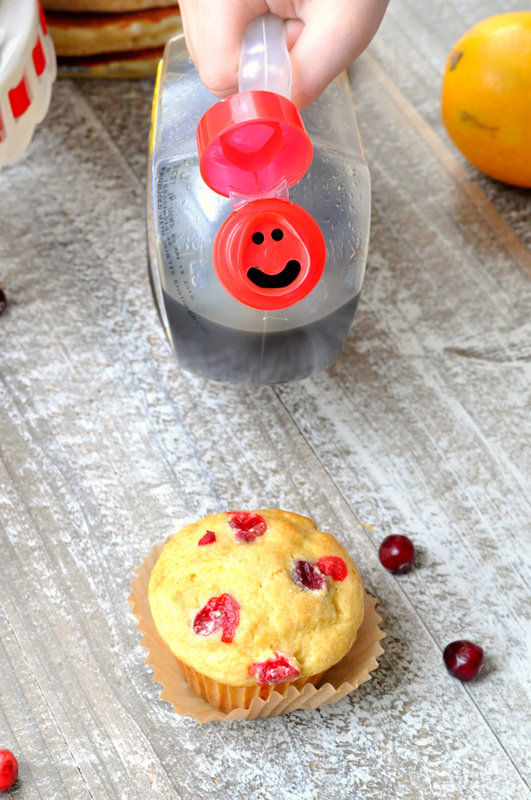 For breakfasts with the whole family, I usually keep these cranberry orange pancake muffins on my Oster griddle. Then, I pop the Hungry Jack pancake syrup in the microwave to create the perfect breakFEAST! Preheat oven to 350 degrees. Line muffin tin with paper liners or spray with nonstick cooking spray. Set aside. In a large mixing bowl, combine pancake mix, milk, eggs, orange zest and Hungry Jack pancake syrup. Mix well. Divide batter between prepared muffin cups filling each to 2/3 full (you may have extra). 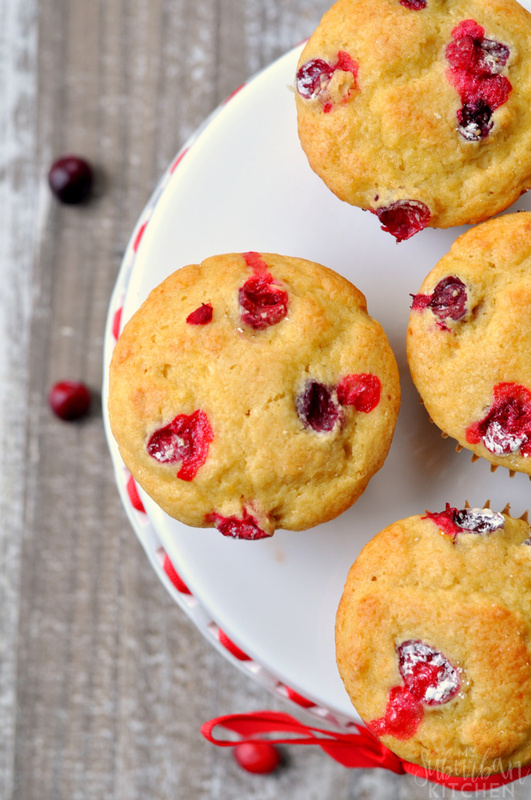 Divide cranberries between muffin cups. Bake in preheated oven for 15 minutes. Remove from oven and enjoy topped with Hungry Jack pancake syrup. Sounds good. Thanks for sharing on the What’s for Dinner link up – Would love to have you give us a comment at the party! Oh boy do those look good! Pinning them so I can have my very own! Thanks so much for sharing this with us at the DI & DI Link Party. We really loved having you! What a perfect Muffin for the holidays, this looks delicious! Hope you have a fantastic weekend and thanks so much for sharing with us at Full Plate Thursday! Portable pancakes? Sign me up! These look super yummy! Thanks for sharing at the Inspiration Spotlight party. Shared. Happy Holidays! These sound delicious and it’s nice that I can take a short cut and use Hungry Jack pancake mix 🙂 Thanks for sharing this on Merry Monday. I’ll be including this in a Christmas breakfast round-up and pinned. Those look delicious! Thanks for sharing with us at the Funtastic Friday Blog Hop!